Mark O'Meara (PGA tour player) - "Awesome show. You are the best trick shot guy in the business." John Daly (PGA tour player) - "I could watch your show again and again, amazing." Bruce Jenner (Olympic hero) - "Wow, what an athlete. Your show is spectacular." 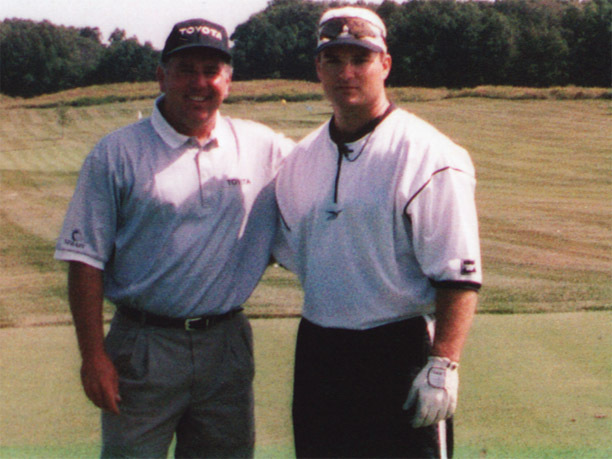 John Cook (PGA tour player) - "The Hit Man's athletic ability is incredible. A unique and entertaining experience." Brad Faxon (PGA tour player) - "Tremendous hand-eye coordination and excellent entertainment." Tom Kite (PGA tour star) - "That was truly amazing, great show." Bobby Rahal (Racing legend) - "The Hit Man knows what it means to entertain. Great show." Richard Karn (Actor) - "Absolutely the most entertaining golf show that I have ever seen." Craig Stadler (PGA and Champions tour star) - "The Hit Man is the best show in golf." Jack Nicklaus (The Golden Bear) - "An outstanding display of hand-eye coordination." Lee Majors (The six million dollar man) - "If I am worth 6 million your show is worth 12." VJ Singh (PGA tour player) - "Unbelievable, can you teach me how to do that?" Jay Sigel (PGA tour player) - "You are a delight to watch. Everyone needs to see The Hit Man at least once in their life." Jimmy Connors (Tennis great) - "Wow, what a show." Dan Marino (Football legend) - "You have an amazing show that everyone should see." Tom Lehman (PGA tour player) - "The Hit Man is awesome." Kevin James (Actor/Comedian) - "Hit Man, you are unbelievable." Jack Nicholson (Hollywood legend) - "You are one talented individual." Cheech Marin (Actor) - "It's the coolest golf show on the planet." Joe Pesci (Actor) - "Great show as always. I might have to quit this acting thing and go to work for you." Jim Flick (Instructor to the PGA touring stars) - "Chuck's impressive display of entertainment is simply awesome." Arnold Palmer (The King of golf) - "A truly great show to see." Sandy Lyle (PGA tour player) - "That was quite a show. Extremely entertaining." Greg Norman (The Great White Shark) - "Tremendous, an unbelievable show." Reggie Jackson (Baseball legend) - "Wow, I still can't believe what I just saw." Terry Kiser (Actor, Weekend at Bernie's star) - "Hit Man, you are unbelievable. I never would have believed it if I hadn't seen it." Fred Couples (PGA super star) - "Wow, your show is incredible. Great job." Sylvester Stallone (Rocky and Rambo) - "What you do is unbelievable." Chi Chi Rodriquez (PGA and Champions Tour superstar) - "You are the best I have ever seen." Ben Crenshaw (PGA legend) - "One of the most unique things that I have ever seen." Gary Player (PGA legend) - "Fantastic, the best I have ever seen." Bob Murphy (TV golf commentator) - "The Hit Man's show is made for TV entertainment." Paul Azinger (PGA Tour Star) - "Awesome hand-eye coordination! An amazing show". Glenn Frey (Musician, The Eagles front man) - "The Hit Man is fantastic. The greatest golf show on earth". Dave Winfield (Baseball great) - "Very impressive, I wish I could do that." Gary McCord (CBS golf analyst, Touring Pro) - " Iv'e seen Nicklaus, Iv'e seen Palmer, The Hit Man is the best thing I have ever seen". Dennis Hopper (Actor) - "The Hit Man's show is one of the best things that I have ever seen."